Finally, after months, days and hours of organisation the first session of the Cornwall Film Festival 2018 was realised. A small group of TV comedy devotees gathered eagerly to meet renowned local comedy aficionado, James Henry. Known best for Smack the Pony, Green Wing, and his work on hugely popular children’s TV series, James was insightful with his recommendations to the group of how to shape comedy writing and get ahead in TV. His invaluable tips on clarity, world building, emotional arcs and what drives an episode are sure to be put to good use by the attendees whose scripts he had read in advance. 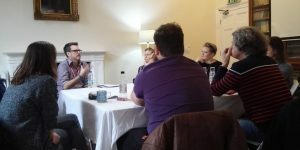 James freely handed out some invaluable tips on writing good comedy and stressed the need for building relationships with industry professionals to help realise personal dreams. Amongst his most profound nuggets of advice were the suggestions that most good comedy should also work as a drama, just without the gags, and that sitcoms work best with panicky plots. This calibre of personal insight into writing for Sitcom is hard to come by, and it is thanks to a close collaboration with Cultivator that allowed this event to take place.